Sun-North has been manufacturing curtains and hardware for over 25 years. Fabric curtains are an economical method to close an opening in a side or end wall of a building and then operate these curtains either manually or automatically to allow ventilation. Sun-North curtain fabric comes in an infinite variety of weights and colours to satisfy any number of applications such as a high sidewall curtain for dairy, 10 layer insulated curtain for poultry and translucent fabric for riding arenas. Sun-North produces a number of rigid panels. 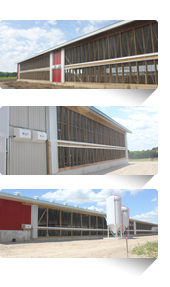 These panels move up and down over openings of ½ m to 3 m in the sidewall of a livestock confinement building allowing fresh air and light to enter the facility. Good ventilation is the second most important factor in raising livestock profitably. Sun-North manufactures a variety of panels, some with a very high insulation factor and some that are sliding glass panels. These panels can be a series of 1 m long panels or single panels that are 50 m long. Natural ventilation is the ideal solution but there are situations that require power assistant to create a healthy livestock environment. This can take the form of fans mounted in chimneys or fans in end walls to create tunnel ventilation. In some barn designs both natural and forced air or fans would be used to create the optimum environment. Some may need natural and ceiling circulating fans. Where the density of animals is very high such as caged poultry layer barns then forced air through fans and forced air inlets may be the only answer. Synchronizing air intake and exhaust and heat and cooling along with outside wind and temperature conditions takes the application of state of the art electronic controls linked to computer technology. Sun-North builds it own power drives and actuators in a number of drive formats to suit the numerous variety of applications. Sun-North builds it own line of electronic controls and wind and temperature sensors under the brand name of Shepherd. Sun-North has the staff to coordinate these controls with on site or remote computer logic.